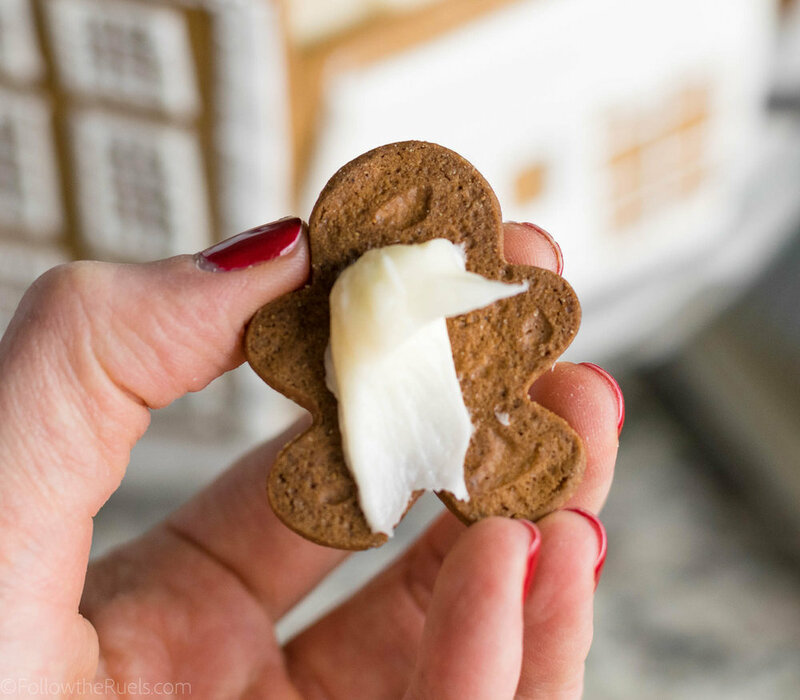 Every year around Christmas time I convince myself that I should make a gingerbread house. From scratch. But I never actually go through with it. I think I have been burned by gingerbread houses in the past. The pieces never fit together well, so they end up just awkwardly stuck together. Or the house ends up collapsing under the weight of all the candy and decorations (maybe I am a little heavy handed with the candy and decorations). 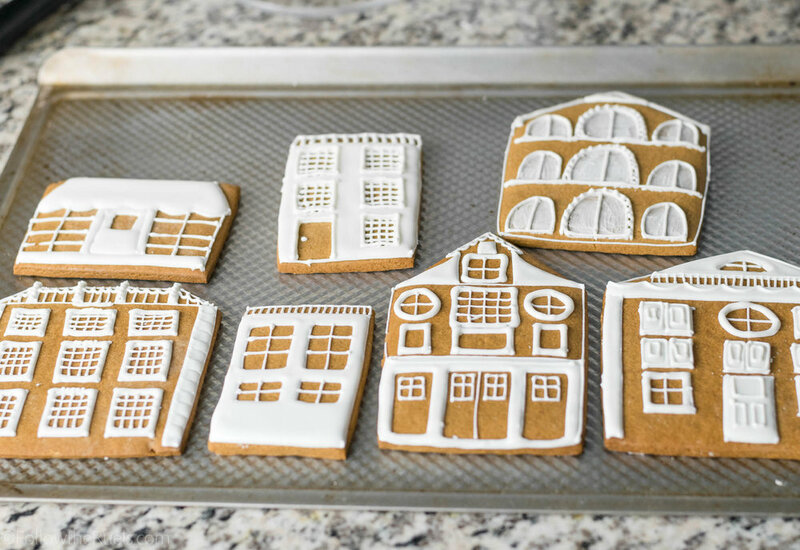 I took inspiration for my little gingerbread village cake from the canal houses in Amsterdam. I am not sure why. I certainly have never been to Amsterdam or seen a canal house in person, but that is that came to mind. I made the houses from my gingerbread cookie recipe and iced them with royal icing. I just cut them by hand into various shapes and sizes. Some tall and skinny, some short and fat. Some with flat tops, other with pointed tops. There wasn't really any rhyme or reason to it, other than I wanted some variety. Then I went to decorating. I used images from Google to help me figure out the windows, roof, doors, etc. 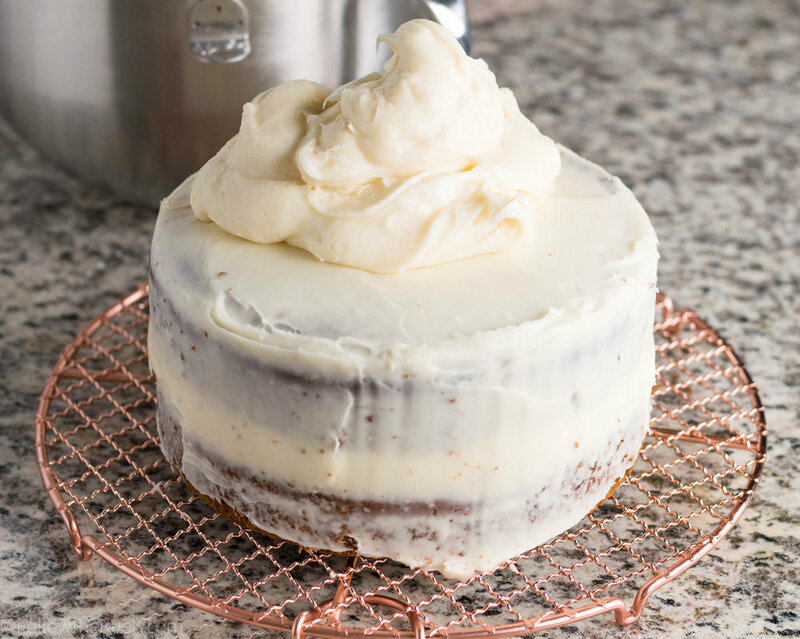 For the cake itself, I adapted this recipe for a gingerbread latte cake. Talk about scrumptious! Oh my word, this cake was good! The best part, though, was the cream cheese frosting on top. After the layers of cake were baked then chilled, I leveled them with a serrated knife. I topped the first layer with a huge dollop of cream cheese frosting and spread it evenly around the surface with an offset spatula. Then set the next layer on top of that and repeated with another huge dollop of icing. This time, I spread the icing all the way down the sides to cover most of the cake. I didn't do a huge layer of icing, I just wanted to catch all the crumbs first so they didn't end up in the outer layer of icing. After a quick chill in the fridge, just long enough for the icing to set up, I finished icing the whole cake and set it on my cake stand. The beauty of this cake is that you don't have to be an expert icer because you are just going to cover it with the gingerbread houses. 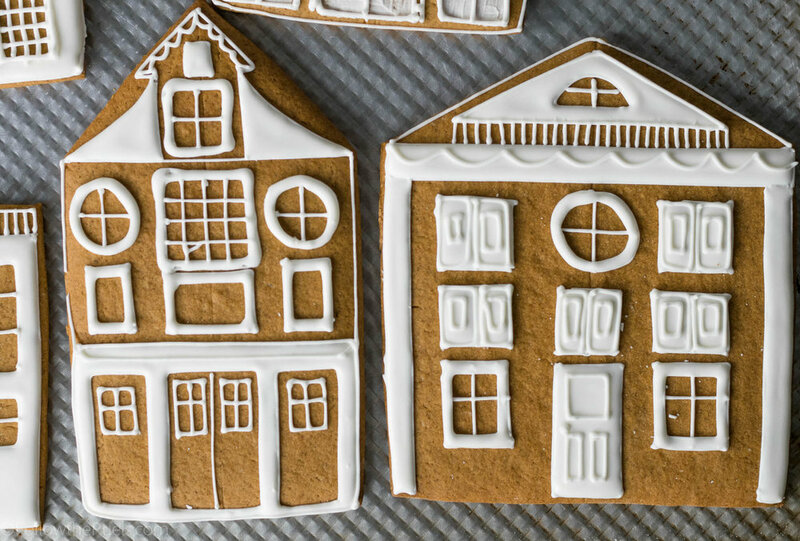 The little houses just stick right onto the cream cheese frosting. Almost a little too well. I wanted to move one of the houses and it just lifted the icing right along with it. To attach the little gingerbread men, I put a dot of the frosting on the back an stuck them right on top of the house. I did finish off a couple of the houses with a few other decorations. I had these cute holly sprinkles that I stuck right on using a bit of left over royal icing. And I added some candy canes and left over Christmas tree cookies. While this cake may have been a bit more work than a gingerbread house, I think I like it even more. For one, when you are done you can eat the cake along with the gingerbread cookies. It's the best of all worlds! If you also want some candy in there, throw a few more candy decorations on top. That way there is a little something for everyone! Preheat oven to 350 degrees. Line two 8" cake pans with parchment paper and spray with a bit of cooking spray. In a large bowl sift together flour, baking powder, baking soda, and salt. Set aside. In the bowl of a stand mixer, cream together butter and sugar on medium speed until creamy. Add in egg and spices and mix until just combined. Pour the molasses into the coffee and stir to evenly distribute the molasses. Mix a third of the flour into the butter mixture. Follow with half of the coffee mixture. Then mix in half of the remaining flour until almost combined. Repeat with remaining coffee and flour. Pour the cake batter into each of the pans and tap to level the batter. Bake for 40-45 minutes, or until a toothpick comes out cleanly. Remove from oven and let cool to room temperature before removing the cakes from the pans. Wrap in plastic wrap and chill in the fridge for an hour or overnight. 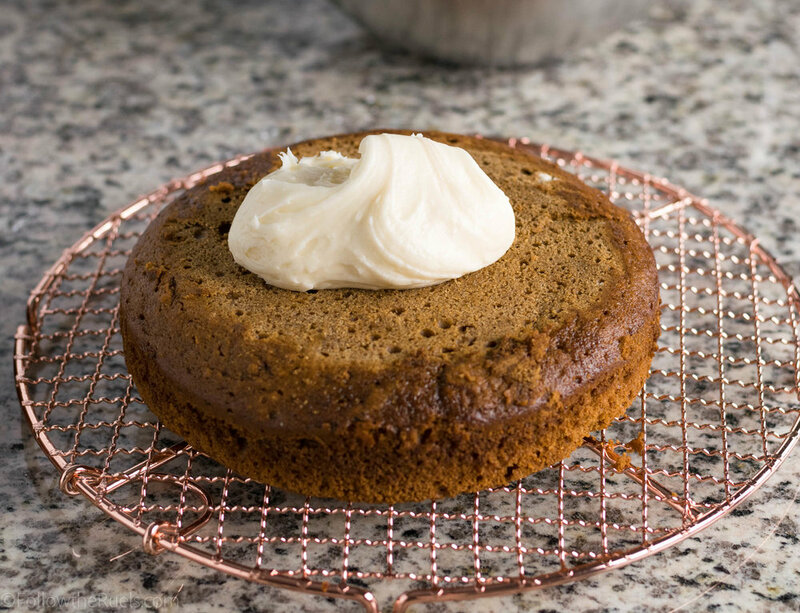 To make the frosting, beat together the cream cheese and butter until light and fluffy. Slowly add in the powdered sugar and the vanilla. Mix until smooth, about 1 minute. When ready to assemble, use a serrated knife to level the cakes. Spoon a large dollop of frosting onto the first layer and spread out with a spatula. Repeat with the second layer of cake. Add more frosting to the sides, and spread around the sides of the cake in a thin layer to trap all the crumbs. Chill the cake for 15 minutes. 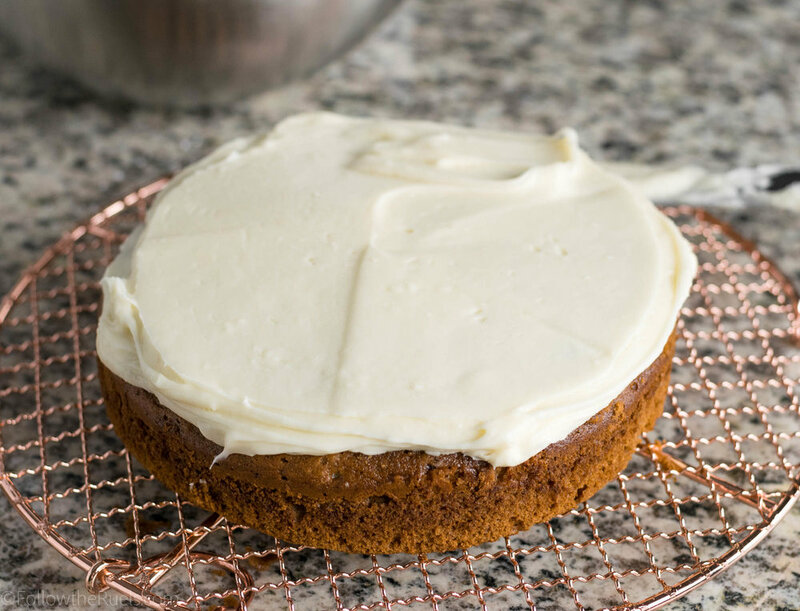 Add more frosting to the top of the cake. Spread out and around the sides until the cake is completely covered. Decorate as desired.